Rainforest frogs are some of the prettiest rainforest animals. Frogs need constant moisture because they have a permeable skin and lose a lot of water. Although there are a few exceptional species such as burrowing frogs, most of the world's frogs live in areas with high rainfall. There are therefore countless species in the rainforests, and these frogs are indeed beautiful and colourful animals. 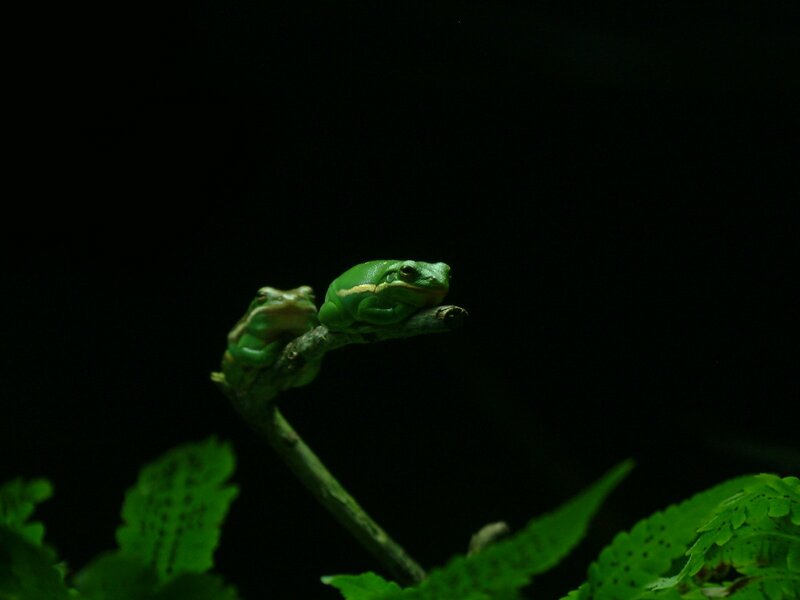 Tree frogs are very common in rainforests. They have got expanded circular discs under their fingers and toes, which enable them to climb. Many species are beautiful bright green and have red eyes. Other famous frogs of rainforests are poison dart frogs. These very brightly coloured frogs are found in Central and South America. While tree frogs are camouflaged to the colours of the plants they inhabit, poison dart frogs are not trying to camouflage. They send a message that they are poisonous instead. In fact, they are some of the most poisonous animals on the Earth. They get their name from the fact that native tribal people use their poison on the top of their arrows and darts. Once poisoned, the dart remains fatal for two years.